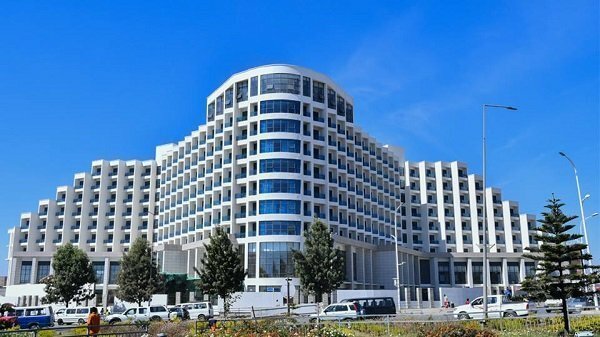 Ethiopian Airlines inaugurated yesterday a five star hotel located in Addis Ababa. With its 373 ultramodern luxurious rooms, Ethiopian Skylight hotel is intended to provide ease to Ethiopian Airlines passengers who are either transiting through Ethiopia or visiting the country. Of course, it is open to provide service to the public as well. In terms of facilities, the hotel has a banquet Hall that could accommodate 2000 guests at a time. It is also equipped with meeting room, Western and Eastern restaurants, traditional Ethiopian restaurant, coffee shop,jazz club, lobby bar and swimming pool. US $65 million is spent for the project. The Airlines has also inaugurated yesterday expanded terminal project which reportedly costed $US 36 million. It has a capacity to serve over 25 million people in a year. Prime Minister Abiy Ahmed and Chairperson of The African Union, Dr.Moussa Faki,were launched the inauguration ceremony at Bole International Airport. While Prime Minister Abiy Ahmed hailed all employees of Ethiopian Airlines for the success it has achieved, he told the management that a much bigger terminal is needed accommodate the growing number of Ethiopian Airlines passengers. Last year, the airlines served about 22 million passengers. Currently, it has over one hundred destinations across the work and over hundred planes in the air. 2 Responses to "Ethiopian skylight five star hotel inaugurated"
As it is a natural gift to WISH, I would dream of staying at the PALACE for one week. I am just being practical! . As I wrote somewhere, Ethiopian Airlines is the GREATEST success story in Ethiopia, in Africa and among top notch World Airlines. PERIOD!